Reviews | Grill Brick Holder - 7 5/16" x 3 1/2" x 2 1/2"
Grill Brick Holder - 7 5/16" x 3 1/2" x 2 1/2"
If you use grill bricks to clean away carbon build up on your grill, this grill brick holder is for you! It securely holds bricks so that you can easily clean your grill grates. As opposed to wrapping bricks in a cloth, this aluminum holder won't leave fibers behind that could potentially contaminate your food. Plus, this holder gives you a firm grip and protects your hands from the rough, greasy surface of the brick . I used to not really think I need a grill brick holder and would just use the brick itself without a holder but this has changed my mind completely. This grill brick holder does not clamp down very well on the grill bricks unless they are brand new and haven't been worn down at all. It was a nice thought, but we haven't been able to get this to work effectively. Thank you for your review, Daddy D's BBQ! We are sorry this Grill Brick Holder - 7 5/16 inch x 3 1/2 inch x 2 1/2 inch has not worked well for you. A Customer Solutions Representative will contact you soon! This one works great is a really needed item for a grill owner, fit great in the bricks and holds very well, really strong contruction, amazing! The grill brick holder does not hold the brick when you try to clean the grill. It is now sitting on a self in my restaurant. This grill brick holder is ok. I wish the sides came down further so it held the brick better, this slips off during scrubbing and just tears into the brick leaving the dust everywhere. Gets the job done. Great product. Works well for holding grill bricks. Highly recommended for people and businesses looking for grill brick holders that are secure! This grill brick holder is perfect for any restaurant using grill bricks to clean their grills. Keeps your hands away from the hot grill surface and allows you to use the brick right down to the end. This handle works great for us. It holds the brick securely and allows you to keep a grip and a few inches between your hand and the surface. Cleans easy and is sturdy. It doesn't handle the brick very well and the amount of pressure it takes to hold the brick can actually make the brick break apart. Thank you for the review! We’re sorry this has not worked well for you. We recommend using this grill brick holder with this brick Scrubble by ACS GB12-TSH 8" x 4" x 3 1/2" Grill Brick instead! I'm glad this was cheap. In theory it works, but when you are actually using it, it tends to come apart. It is easier just to hold onto the grill brick with your hand. I thought this would make it easier to clean our griddle. The griddle blocks do not stay attached because of the pressure needed to clean the griddle..We only got one or two uses out of it and stopped using it. We appreciate your review, Scott! A Customer Solutions Representative is currently assisting you in getting a credit back to your account. This is a must have with a grill brick. This makes the cleaning job a breeze and saves your hands from getting burned. Your cooks will love it. This grill brick holder has been well received by the staff! Before they were using towels and such, but this holder gives them the control they need to clean off the griddles. If you use the bricks, then get the holder! 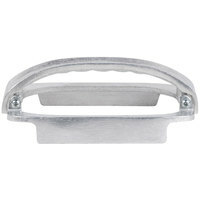 I purchased the grill brick holder in the model #407GBH7. This holder fits snugly into the grill brick and stays in place when you clean the surface. This grill brick holder helps to save your hands from burning due to slipping off of the grill brick while using it to clean your grill . I'm a grill brick guy and have always used bricks for my griddle but always just held the brick with a glove. I saw this product and decided to give it a try. I think it's a good idea, I just can't get the brick to stay in the holder. Every time I seem to get a good scrub going, the brick pops out of the holder and I have to re-attach. I've gone back to the glove. I bought this grill brick holder because I got tired of using my hands to hold the grill brick. My hands would get black and greasy.Works as advertised. This product is very well made and affordable. Based on quality, price, and usefulness i would recommend this product. The grill bricks for this item can be found on this website as well. No good. This holder simply doesn't work. The grill bricks are too brittle to allow this handle to "clamp" on without destroying the brick. It will hold until you attempt to use it. This handle simply doesn't work. Thank you for your review! We are sorry this is not working for you, a member of our Customer Solutions team is currently in contact with you about this issue! This handy brick holder makes cleaning a lot easier. No more hot fingers. I would buy another if anything happened to the one I have. Ok, so I gave this 1 star because the concept is good, but the application is terrible. You can tighten both ends down however you want, but the unfortunate part is that you're -still- tightening a grill brick. What this means is that it simply crushes under the pressure, and it simply can't be held onto, thus falls out and is useless. I'll just go back to holding the brick by hand again. Easy way to keep your hands from getting messy while cleaning the grill. Be sure to have a screwdriver handy when placing this on the brick. This gives you some needed leverage with the brick. This is a nice tool for cleaning a flat top grill. It helps protect your hands from steam burns. It works well as the brick wears down. Great for applying more pressure. I am giving this 4 stars because of the product function. I bought this to try it out on the griddle bricks instead of using my hand to hold the brick. The product is well made and not a bad price. when i clamped the handle to the griddle brick and started using, it seemed that the griddle brick would become loose and the handle would come off. This may be because of the griddle bricks being soft. Not a bad product, just didn't work for me. the Grill Brick Holder - 8" x 4" x 3 1/2" is very handy to have so you dont burn your hand on the grill. The Grill Brick Holder 8"x4"x3 1/2' is great. It holds the bricks perfectly, The clean up crew love it. They don't get their hands all dirty.The price is right .Amust have if you use cleaning bricks. this is a nice little holder for the costs. the bricks fit well in the holder. easy to clean. should buy if you buy the bricks. This grill brick holder works nicely to offer your cooks a way to clean flat top grills without getting their hands dirty!! Securely keeps block in place!!! Holder does the job - it does loosen up after a few passes on the grill - just retighten and keep on going. Reasonably priced and functional. Handy contrapment to have around, paired with the grill bricks, it makes nightly cleaning of the grill a breeze. It's nice to be able to buy everything you need in one place at a great price. This holder works great will the Continental grill bricks. Makes cleaning the grill much easier than holding the bare brick with your hand and it lasts a long time. Couldn't do without this holder. Makes using the brick so much easier. No hot towels for us. Just put the brick in and tighten thescrews. Easy.